A healthy and nutritious Rajasthani recipe that is rich protein, iron and fibre. 1. Dry roast the bajra and green gram in a pan. 2. Add enough water and turmeric powder. 3. Pressure cook till mushy. 5. Fry the cumin seeds, cloves, ginger, green chillies and curry leaves. 6. Add to the bajra mixture. 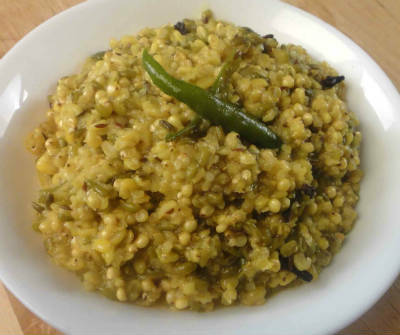 Feel free to comment or share your thoughts on this Bajra Khichdi Recipe from Awesome Cuisine.